The farmer changes the frame of reference for milk by comparing it to Redbull instead of the expected milk vs “other milk” comparison. By doing so it changes the framing of milk for the consumer which now makes milk seem like a bargain compared to the Redbull and hence reduces the original problem with the milk being perceived as too expensive. Framing is the proven fact that people is affected by how, what way and/or by from whom information is presented to them. This fact means that people can come to different conclusions from the same presented information depending on different “frames” as you can see in the infographic below. Usually when talking about framing the focus is on loss aversion; how we as people overvalue potential losses in comparison to how we undervalue gains and tend to choose “not to lose” instead of the chance to win. The ideal situation is where you can create a mental “Blue Ocean Strategy” by stepping out of your products category in order to achieve higher perceived value. This could be by communicating a cross-category comparison for your product which would could work as an anchor for your product to tie it to a different category and make your offering perceived as more salient (when the actual delivered value never changes). To test this I would start with looking for products that has similar characteristics or fill a related need but is perceived as different from your own product. Take the example presented by Rory Sutherland with video conferencing. The historical framing of videoconferencing is almost as form of punishment, or a poor mans business travel; “the company has decided that you are not trusted enough travel and represent the company, the videoconference is in the basement”. If we change the frame of reference and frame it that you as an employee is too valuable for the company to spend time traveling and compare it to other exclusive offerings the perceived value should change accordingly. 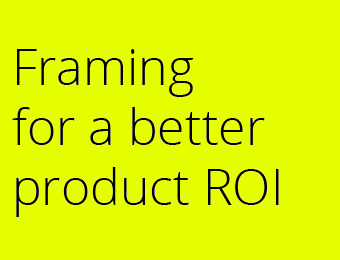 By changing the framing of a product you can get another purchasing behavior from consumers. Comparing your product or service with products in different categories and at different price, you can increase the perceived value and make your own offering more salient for consumers which will increase your earnings while delivering the same product. The Choice Architect - Creativity + Science + Process - to transform thinking.